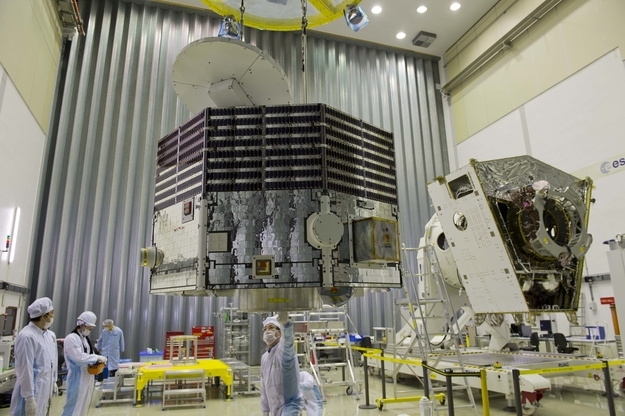 The flight model of the BepiColombo Mercury Magnetospheric Orbiter (MMO), which arrived at ESA's European Space Research and Technology Centre, The Netherlands, in April 2015, is pictured here. The MMO has been lifted off of the base of its transport container and is ready to be mounted on its integration stand. The MMO integration adapter (on the yellow stand) can be seen in the background. The large disc on top of the spacecraft is the high-gain antenna, which will be used to transmit data back to Earth. The protoflight model of the Mercury Transfer Module (MTM) is visible on the right. MTM will provide solar-electric propulsion for the spacecraft stack during the journey to Mercury. BepiColombo is a joint mission by ESA and the Japan Aerospace Exploration Agency (JAXA), executed under ESA leadership. The MMO is contributed by the Institute of Space and Astronautical Science (ISAS) at the Japan Aerospace Exploration Agency (JAXA). ESA is building the Mercury Planetary Orbiter (MPO), the MTM and Magnetospheric Orbiter Sunshield and Interface Structure (MOSIF).